Want More Satisfying Friendships? The Data Is In! Well would you like me to share with you some of the insights that jump out at me when I look at all 4,064 of your results? Yes? Okay! For you, I will spill the beans! Here are some learnings, surprises, and insights! Overall, we're not impressively satisfied in our friendships. As I've been doing for years, I also asked each woman how satisfied she was on a scale of 1-10 (with 10 being the most satisfied) with the level of frientimacy (friendship intimacy) in her friendships. The results on this survey? We average 6.4 out of 10. That's a sold D for most of us. And we're still almost twice as likely to put a 1 or 2 as we are to put a 9 or 10. So the good news? We're collectively feeling the hunger for more frientimacy! Your overall satisfaction IS correlated to how you evaluate yourself as a friend. Across the board-- the higher your personal scores as a friend in the 3 Requirements: the more satisfied you were with your friendships. Those of you who scored your satisfaction the lowest (1-3 out of 10) averaged scores in the 50's and 60's in each of the 3 Requirements; whereas those who scored your satisfaction the highest (7-10 out of 10) averaged scores in the 70's and 80's. That's encouraging as it leads me to believe that if we practice becoming a better friend-- our overall satisfaction might improve! In fact, for every 2-3 points you raise one of you Requirement skills-- your overall satisfaction jumps up one whole number! Outliers tended to view themselves more favorably than their friendships. There were some outliers to the above research where, for a small handful of people, their overall relationship satisfaction didn't correlate with their personal scores in the 3 friendship skill requirements. But as personal growth research has long showed that we tend to view ourselves as better or healthier than we are-- because we know our motivations, obstacles, and intentions, it was true here, too. I found it interesting that while there were less than 5 women who claimed to be so satisfied their friendship that they ranked a 9 or 10 overall, but who scored themselves low (50's) in one of the 3 Requirements; on the flip-side, there were almost 70 women who claimed little satisfaction in their friendships (1 or 2 overall) but who scored themselves high (80's) in their friendship skills. In fact almost 5 women basically scored themselves as 100's in all three Requirements of a Healthy Friend and yet claimed their satisfaction level to be a 1 or 2, out of 10. My mind can barely wrap around how they can have no satisfaction in their friendships and yet think they are perfect in increasing the positivity of their friends, initiating consistency, and sharing appropriately. It leaves me wondering if more of us need to be asking people around us to give us feedback as to how they experience us and if we wouldn't be wise to collectively assume we can always improve how we're showing up and practicing friendship? The lowest self-scored Requirement of Friendship is Positivity. I will admit this one surprised me big time! Whenever I'm teaching the 3 Requirements and ask women to raise their hands to which of the 3 they think is their hardest one-- they usually guess Consistency because we're all so busy. But!!!!! You guys!!! Positivity is consistently our lowest score!!! We are collectively only scoring 64 out of 100 so we have a lot of room to practice this area in our friendships. I'll talk more about that in the future-- but basically we could make a big difference in the health of our friendships if we focused on complimenting our friends more, whining less, validating their feelings, being quick to laugh-- and basically aiming to leave our friends feeling better about themselves and their lives for having been with us! This doesn't have to take more time! It simply is a matter of practice! The highest self-scored Requirement Changes as we Become More Satisfied! And here's another surprise result: for those who score their overall friendship satisfaction below a 5-- their highest self score in the 3 Requirements is Vulnerability; but for those who score their overall satisfaction above a 6--their highest self score in the 3 Requirements is Consistency. While that correlation could reveal a number of different interpretations-- I find it interesting that those who are more satisfied in their relationships tend to place higher value on, or report being better skilled at, the regularity/consistency/trust/history side of the relationship over the ability to reveal/share/be vulnerable. 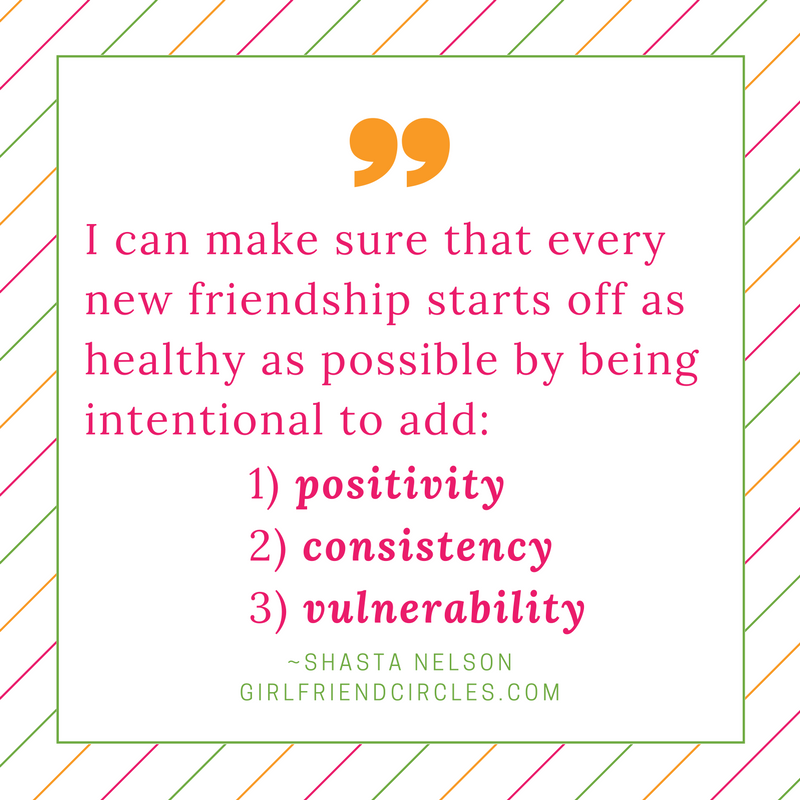 Certainly the more time we make for friendship with consistency-- the chances go up that we are more vulnerable, while the flip-side isn't necessarily as true. I look forward to unpacking these results more and sharing other research with you as I continue to analyze, but in the meantime I invite you to think of how you might practice being a better friend as a pathway to experiencing more satisfaction in your friendships?